One of our family’s favorite meals… lightened up and adapted for the Instant Pot. 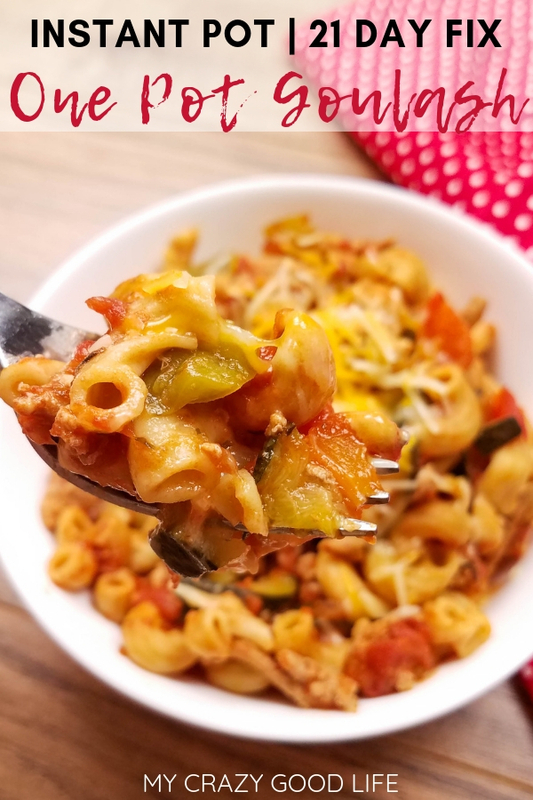 We love pasta, and any time I can add veggies to a meal I’m on it–this Instant Pot Goulash is super easy to make (yes, those are dry noodles I add) and it’s a healthier recipe that’s 21 Day Fix approved, as well! There really isn’t anything better than tossing ingredients into the Instant Pot and having a healthy meal ready to eat in 30 minutes! The healthier ingredients for this goulash are what sets it apart from other recipes. Whole wheat noodles, tomatoes, and extra veggies helps your family get in their veggies and complex carbs while enjoying a delicious meal. 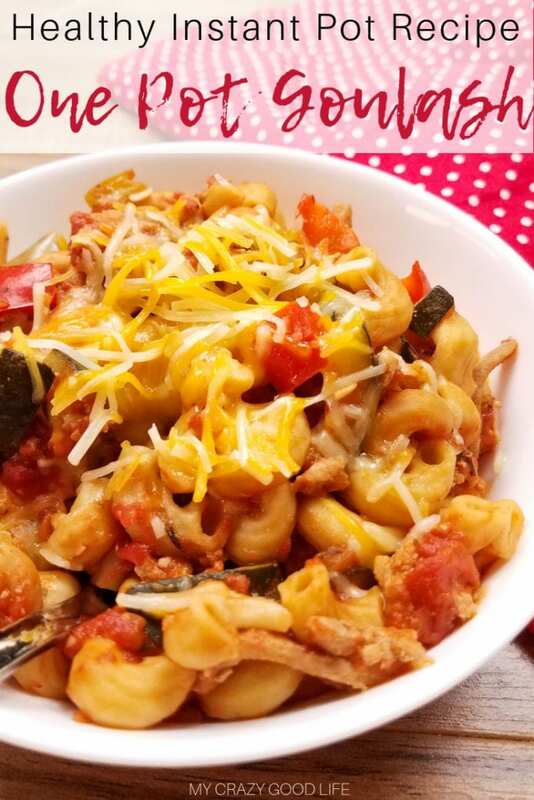 Do you have any tips about this 21 Day Fix goulash recipe? For 80 Day Obsession, double the ground meat and vegetables in this recipe! Makes 6 servings, about 1 1/4 C each. 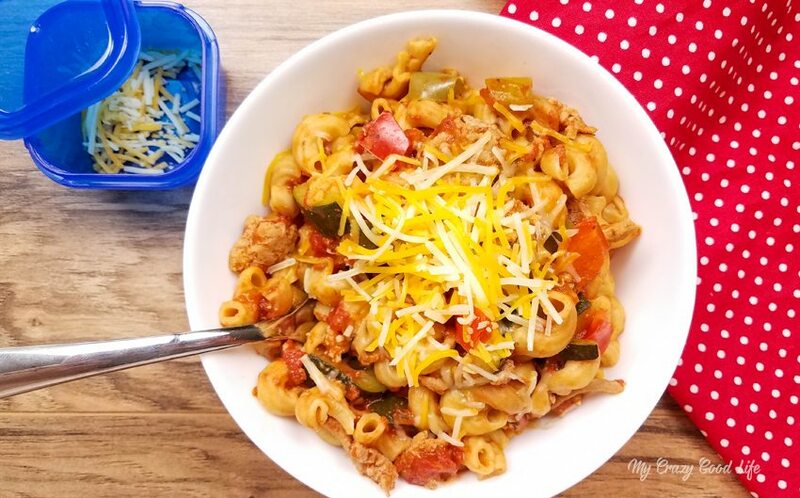 How do I make this 21 Day Fix goulash in the Instant Pot? 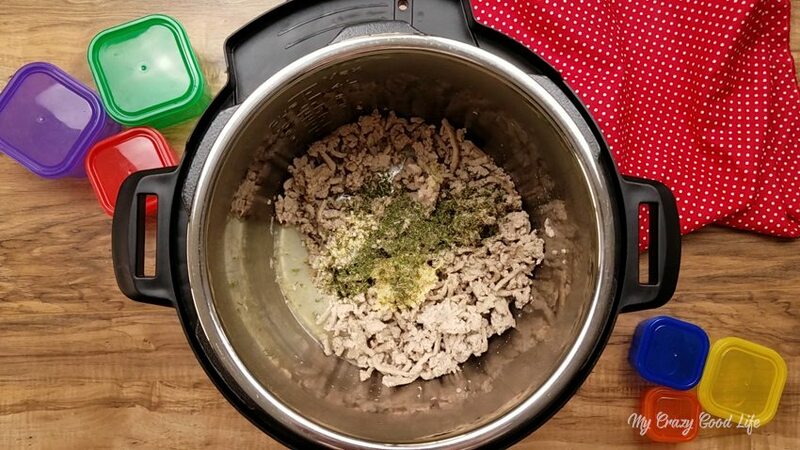 1.Turn the Instant Pot to sauté and brown the ground turkey. I like to coat the bottom of it with some olive oil first. 2. If you’re using jarred pasta sauce, skip this step and also skip adding the tomatoes. Add garlic, minced onions, Italian seasoning, salt, and 2 bay leaves. Toss in your chopped zucchini and bell peppers, and mix well so the ingredients are evenly distributed. 3. Pour in your dry whole wheat pasta and tomatoes. Go ahead and fill the can back up with water and pour that over the ingredients. If using jarred sauce, I fill the jar halfway with water. 4. Stir until the pasta is fully mixed with the sauce. Lock the lid into place and turn the pressure valve to sealing. Cook on high pressure using the manual function for 4 minutes. Use the quick release method to release the pressure. Give it a stir and let the goulash cool for a few minutes–it’s super hot! Is this goulash recipe Weight Watchers friendly? Yes! Click here for the Weight Watchers version of this post. My goulash doesn’t seem done, why is that? If you think the recipe needs a bit more cooking time you might be at a higher altitude. I’ve recently learned that you need to use this info to figure out cooking times from different regions and altitudes! Do you have this goulash recipe in an ebook? 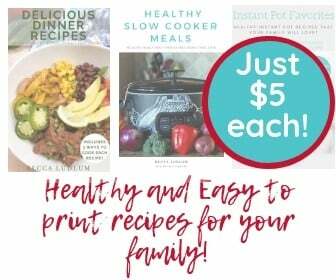 Looking for all of my Instant Pot recipes in one easy to print place? You can buy them here. If you’re looking specifically for 21 Day Fix Instant Pot recipes, I have those available too! 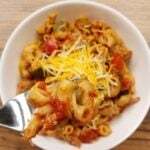 This healthier goulash recipe an easy one pot meal! 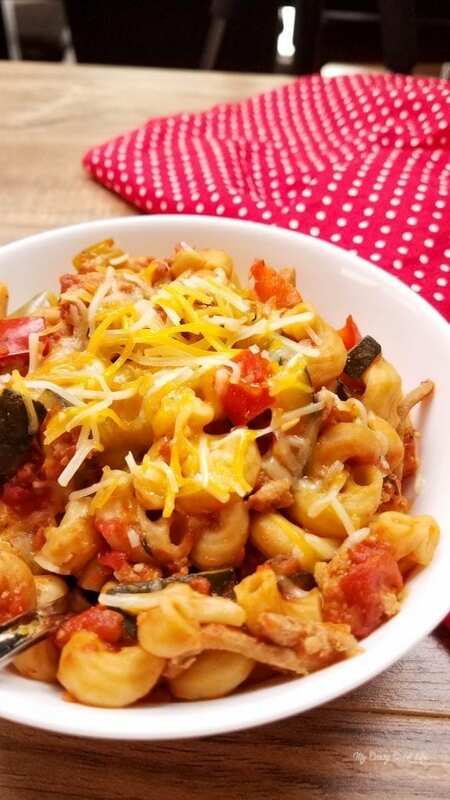 Instant Pot Goulash is a fast dinner that the whole family will love! 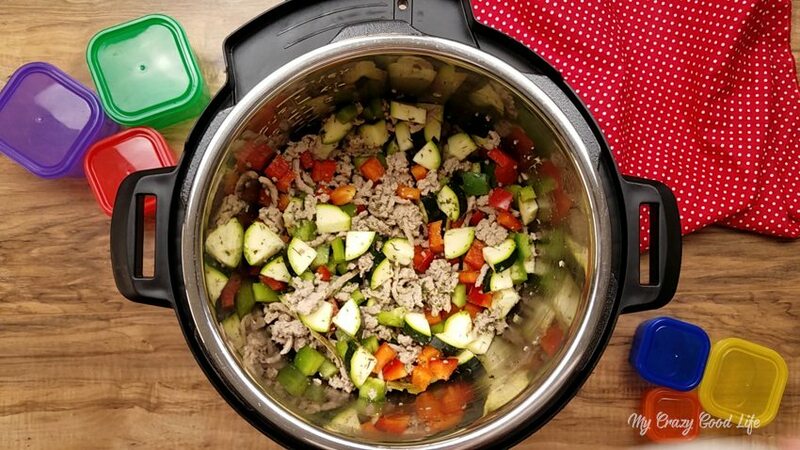 Turn Instant Pot to sauté and brown the ground turkey. Note: If you're using jarred pasta sauce, skip the seasonings. Add garlic, minced onions, Italian seasoning, salt, and 2 bay leaves. Toss in chopped zucchini and bell peppers. Mix so that the seasonings and veggies are distributed. 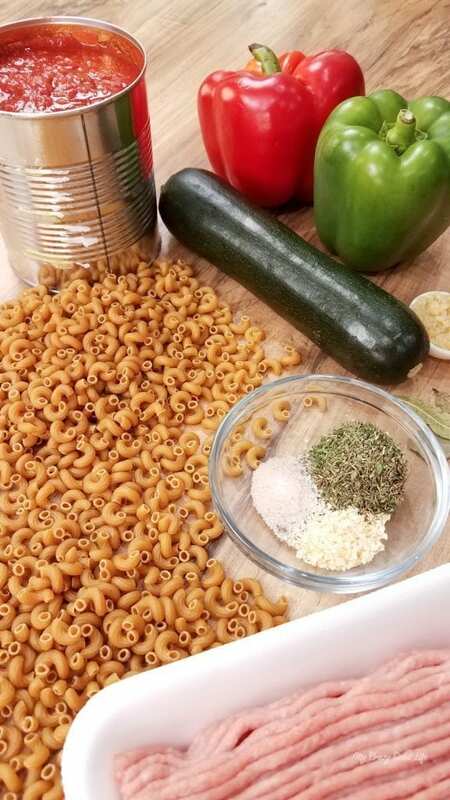 Pour the 8 ounces of dry whole wheat pasta, can of crushed tomatoes (or a jar of pasta sauce), and fill the can back up with water and pour that over the vegetables. Stir until the pasta is fully mixed with the sauce. Lock the lid into place and turn the pressure valve to sealing. Cook on high pressure using the manual function for 3 minutes. Use the quick release method to release the pressure. Give it a stir and let the goulash cool for a few minutes–it's super hot! Top with cheese if desired and serve. Makes six equal servings, 1 1/4C each. 21 Day Fix Container Count, per serving: 2/3 red container, 1/2 green container, 1 yellow container. Stovetop Directions: Sauté ground turkey and boil noodles. Add cut veggies, meat, pasta sauce or tomatoes and spices to a pot and simmer for 10 minutes. You don’t take the bay leaves out??? Made this as freezer prep and it was SO good! I dumped all ingredients except the pasta & water into a freezer bag, and didn’t pre-cook my turkey. I just sort of mixed everything around and made sure most of the turkey was mixed in w/the other ingredients and not one big lump. When I went to prep, I dumped everything from the bag into the IP and set for 10 min (to cook the turkey). Then I opened, added the pasta (4 oz vs. 8 bc I’m doing 80 Day Obsession), and 1 cup water. Set for 3 min. All done!! We also used Goulash seasoning (my friend brought me a whole bag from Hungary) instead of Italian. Hi there – can you let me know how you calculated 3 WW points for this? Thanks! It was delish! Hi Kerry, I used the online WW recipe creator and plugged in all the ingredients and added the servings per batch which calculates it out to 3 points per serving. For reference the only thing in this recipe that has points on the WW program is the pasta. 99% FF Ground turkey is 0 points along with the veggies! Since the cheese is optional, did you or did you not count it in the points? I am having a really difficult time this morning and cannot convert this recipe. I need to make enough for 5 meals and each serving can be 1 Red, 1 Yellow, and 1 Green. Can anyone’s head handle that better than mine on a Friday morning?! My wife doesn’t like Zucchini so I use a medium diced onion instead. I also use an extra can of diced tomatoes with their juices. I made this over the weekend. I used 8oz by weight of elbows and only came up with 1 freestyle smart point per serving assuming 8 servings. The noodles seem a little on the mushy side but I’m hoping that when it is rewarmed to eat tomorrow it won’t be too bad. I am new to the instant pot and trying to decide if it would be better to reduce time or add just a little more pasta. The bites I tasted yesterday were delicious and for a low smart point pasta dish it’s perfect. I can even double the serving at 1 point per serving and keep it low points. Carly, did you use the wheat pasta? If so, I’d reduce the number of minutes you cook for–you might find that with pasta recipes that is something you have to do across the board when you prepare it. This may be a wonderful recipe I haven’t made it yet but I’m wondering why you thought to collect goulash as it does not appear to be related to the Hungarian dish that has lots and lots of paprika, some caraway seeds and has a thoroughly unique flavor that is delicious. Again your recipe may be delicious but it seems misnamed. I just have a couple questions! (1) How are you measuring the 8 oz of pasta? Are you going by weight or by cups? (2) You mentioned you add extra veggies and put them in the food processor to mince them. Would you also toss those in before you pressure cook? Made this using whole wheat shells tonight. It was sooo good! A nice, easy, healthy dinner that the whole family approved of. Will be making again! Could you make this in the crock pot? I don’t have an insta pot and think that cooking it on the stove will make it too mushy?!? Also, for 2B would you just add more veggies to match the plate it? Did you buy any whole wheat pasta or should I look for something specific? Am I able to use gluten free pasta? What is the adjustment please? I can pre cook the pasta on the stove, if not. Oncd the pasta is cooked, do I add to the instant pot, cooked, omit the water and seal per the rest of the instructions? Thanks! Yes, you can use gluten free pasta but I don’t cook with it so I’m not sure about the adjustment. If you cook on the stove, I’d add the noodles at the very end and only cook the sauce and veggies for 2 minutes.